I don't know what is up with your snake, but if I were you I would do the same thing I did for the scale rot~ smear on neosporin daily until the next complete shed cycle. Worked for Marvin, he is all better now. BTW~ I take quite a lot of pride in keeping my tanks clean as well, but Marvin still got scale rot. Marvin was a case of overzealous attempt to keep humidity in his tank high. Turns out the vision tank he is in holds humidity better than I thought it did and condensation was developing under the substrate. 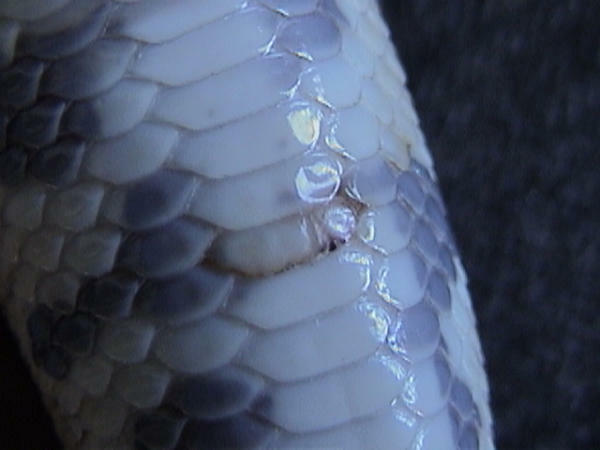 Your snakes injury/mishap looks more dry than scale rot does. Looks a little like you possibly have the oposite problem occuring....is your tank perhaps too dry? Maybe try giving your snake a "Hydro-hide"...a tuperware dish with a hole cut in it and filled with damp moss. I do this for my snakes that are kept in aquariums with screen tops and it seems to help them regulate their humidity.